Moving forward on KY’s custom baby wrap, I got bout 4 wound. Not 4 colors like I’d said in my last post, but 3: chambray, bleu cobalt and bleu moyen. As always, one of my favorite shots is the warp as it’s being wound on the back beam. 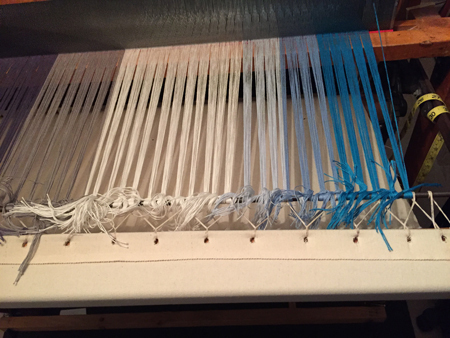 Then I threaded 758 threads through the heddles and the reed, securing them with a slip knot as I work across the width of the piece. After that I have to check for tension issues, and to make sure I don’t have any threads crossed in the reed. 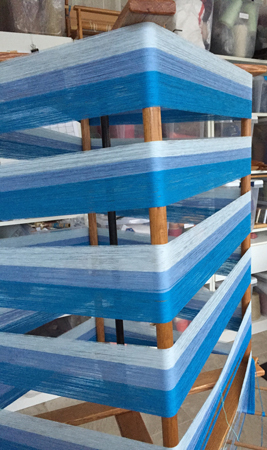 The slats from an old Venetian blind work for this purpose and make a nice, hard surface for the weft. It all looks good. So I wind bobbins and start weaving. 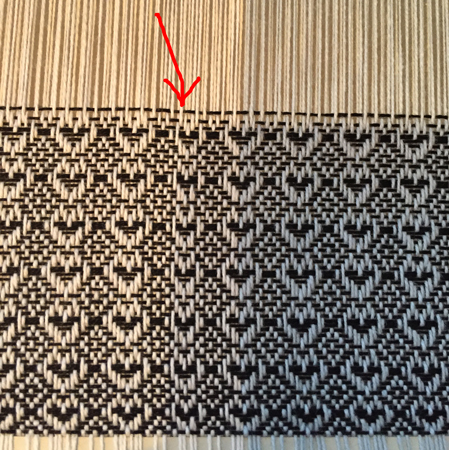 Somehow I manage to get several motifs woven before I notice the problem. I have missed threads, shaft 4 on both the way up and the way down the threading V. Nothing to do but take out what I’ve done and fix the error. I decided to cut the weft threads in roughly the middle and remove them in pieces. 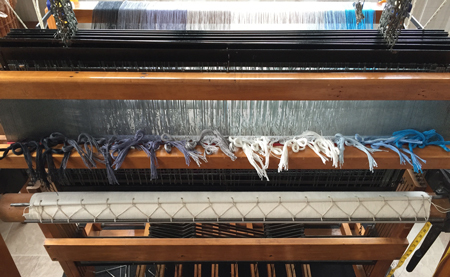 Here I’ve removed the threads on the right side of the loom. And here’s what the process looks like mid-stream on the left side. Then I made 2 string heddles for shaft 4, hung new threads for those 2 spots. Next I had to remove the threads from the reed from the error all the way to the selvedge, re-threading the reed. If I didn’t do that I would have had a spot where the threads were too close together and it wouldn’t have felt or looked right. Finally I got the threads all tied onto the apron rod again. And now I needed to walk away for a while, giving both my brain and my body a rest. 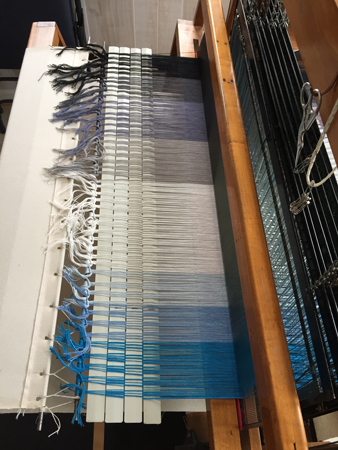 This morning I spread the warp with scrap threads, treadling in order, instead of using those spacers from the blind, as they couldn’t tell me if there were other threading errors. It looked okay, although it was hard to see with the pale and changing colors. 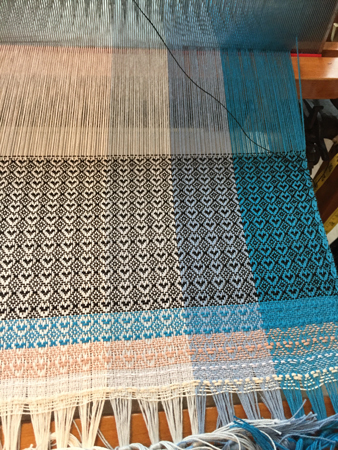 So I again started weaving with KY’s black tencel. Poop!!! Another error!! This time in tie up. A hook had popped off one of my treadles. Can you see the difference? Look closely at the first and second rows of black hearts. The first row has the error. Thankfully I spotted it quickly and fixed it easily. I’m finally on my way! 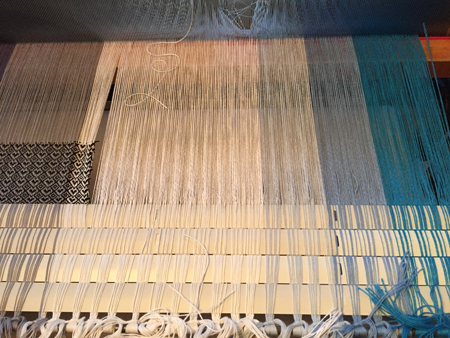 I got about 45″ woven today. Not much, considering it’s taken me many days to get to this point. 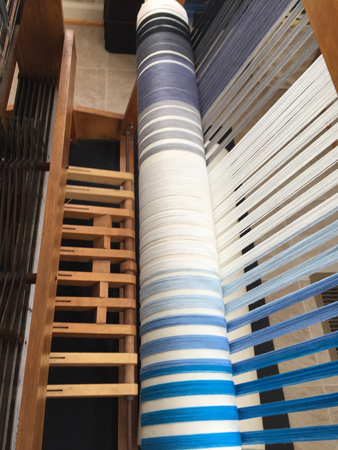 And after I weave off the 15 yards of this warp and do all the inspecting and other off-loom work, I have 2 other custom weaving jobs waiting, one for a shawl, the other for a scarf. 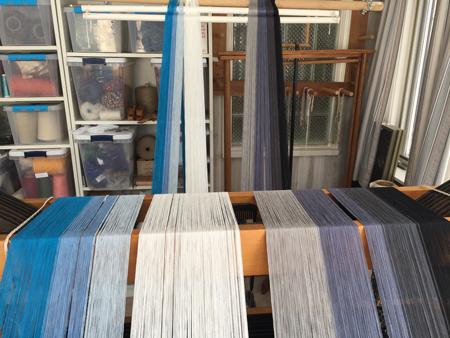 The Weaving Center has been taking up lots of my time. I think that should slow down dramatically soon, but probably not till February 1. Oh No! Must have been stressful. 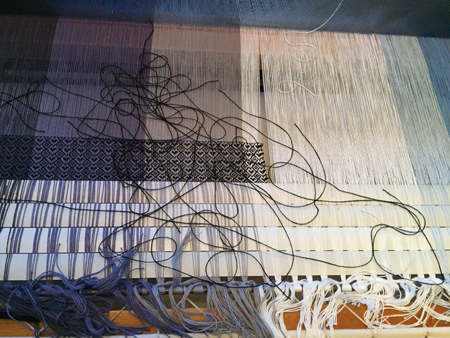 Not a nice thing to happen, but happy to know that weaving is going well. You’re such a trooper. Not as stressful as it was frustrating, Perry. 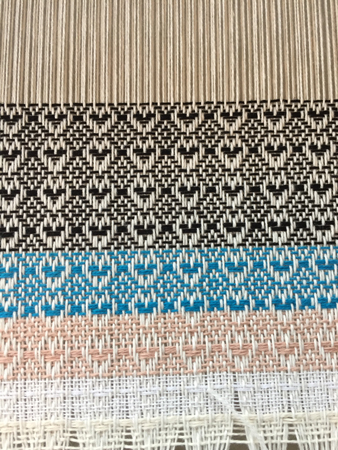 Weaving has the possibility for so many errors. I try to double check my threading as I go, so not sure how I missed this. Sigh. My sympathies with the threading error. What a pain. I likely would have cut what I wove off and fixed and retied. Kudos for unweaving! And kudos for such beautiful cloth! Love the colors. Pulling out the weft wasn’t particularly hard or time consuming, Theresa. 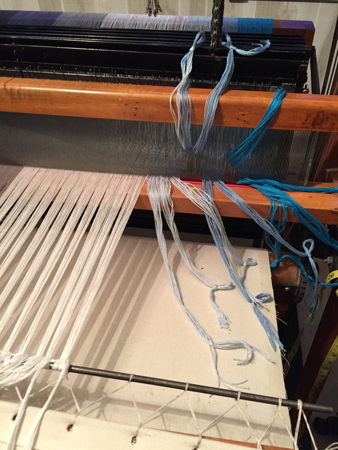 Much easier and quicker than actually unweaving that much, which I have done in the past. Sorry for your trouble, Peg. Some days are just terrible, horrible, no good, very bad ones!